The idea of producing new sounds from a piano played with a bow has been around since 1972, when composer Curtis Curtis-Smith first suggested it. Now Soniccouture has made his ideas a reality for computer musicians by producing a new sampled instrument. To get the sounds in this way, a flexible bow is used, which is made from monofilament nylon fishing-line and coated in rosin. 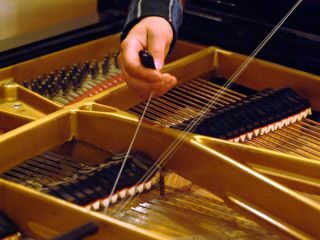 A sustained tone can then be created by threading the bow under the piano strings and moving it backwards and forwards. For the samples, Soniccouture used a 9ft Baldwin Grand and recorded each key at three velocity levels: hard, normal and short (or staccato). There are alternative samples for each key, too, meaning that each one heard will be slightly different from the last. The normal and hard samples are infinitely looped for drone connoisseurs, with the mod wheel enabling you to switch between the different velocities for variation. The samples are in 24-bit/44.1kHz format and require 1.6GB of hard drive space. You'll also need to own either Native Instruments' Kontakt or Logic's EXS24 sampler to run Bowed Piano. It's available for download now at Soniccouture, priced at $99/£49.